Okami, is an action adventure game that takes place in a classical Japanese setting, and combines several Japanese myths. The story follows along with the land being saved from darkness by Amaterasu, the Shinto sun goddess. Amaterasu, the main character in Okami, is helped out by her guide Issun through various quests and extra side quests. Extra activities include making trees bloom and feeding wild animals. Combat, which is staged in a ghostly virtual arena, in addition to earning you the normal amenities ( money, bonuses for a job well done ) can also earn you Demon Fangs. You can trade these for additional unique items which are helpful to the game but not necessary to have. Those of you who like this type of game can enjoy the updated HD version and will soon be able to do so while wearing a cool Okami hoodie. 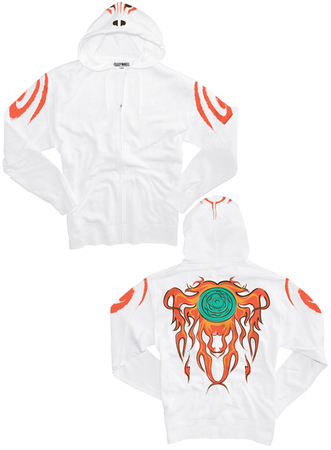 Here is an Okami’s Creed video which shows the hoodie being worn. Will you be purchasing one?